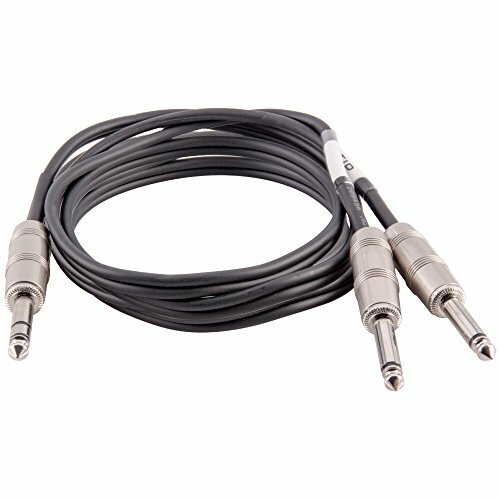 6 Foot 1/4 Inch TRS Stereo to Dual 1/4 Inch TS Mono Splitter Cable - Model #: SA-Y86, Contents: 6 Foot 1/4 Inch TRS Stereo to Dual 1/4 Inch TS Mono Splitter Cable, Application: Interfacing and Connecting Pro Audio and DJ Equipment, Connectors: 1/4" TRS on one end, Dual 1/4" TS on the other end, Features: Splits 1/4" Stereo signal into two 1/4" Mono inputs, Shielded to prevent interference, Nickel Plated Connectors, 24 Gauge Audio Splitter Cable, Tip and Sleeve cables are clearly labeled, Covering: Flexible Black PVC Jacket, Length: 6 Feet, Condition: New, Weight: 0.30 lbs. each, Warranty: One year warranty. These 6 Foot TRS to Dual TS Y Splitter Cables are a must have for the musician and sound engineers toolbox. Keep these splitter cables on hand in the event you need to connect two audio devices through a 1/4" insert on a mixer. You can also use this insert cable to split a 1/4" Stereo Headphone out to two 1/4" Mono Inputs. All Seismic Audio cables are high quality, durable and provide years of trouble free, crystal clear sound. With your purchase, you will receive one 6 Foot 1/4 Inch TRS to Dual 1/4 Inch TS Y Splitter Cables pictured and described above. You will also receive top notch customer service, plus all the technical expertise you will ever need is just a phone call or email away! Join the Seismic Audio revolution and see what tens of thousands already know. Whether it is for the garage band, live sound, stage, or studio...Seismic Audio is bang for the buck, the best Pro Audio gear for all PA applications!